Butterfield PG. Thinking Upstream: A 25-Year Retrospective and Conceptual Model Aimed at Reducing Health Inequities. ANS Adv Nurs Sci. 2017 Jan/Mar;40(1):2-11. Schenk E, Corbett CF, Barbosa-Leiker C, Postma J, Butterfield P. Psychometric Properties of the Nurses’ Environmental Awareness Tool. J Nurs Meas. 2016;24(2):55-71. Oneal GA, Postma J, Odom-Maryon T, Butterfield P. Retest of a Principal Components Analysis of Two Household Environmental Risk Instruments. Res Nurs Health. 2016 Aug;39(4):277-85. Oneal GA, Eide P Hamilton R, Butterfield P, Vandermause R. Rural Families’ Process of Re-Forming Environmental Health Risk Messages., J Nurs Scholarsh. 2015 Jul;47(4):354-62. Butterfield P, Schenk E, Eide P, Hahn L, Postma J, Fitzgerald C, Oneal G. Implementing AACN’s recommendations for environmental sustainability in colleges of nursing: from concept to impact. J Prof Nurs. 2014 May-Jun;30(3):196-202. 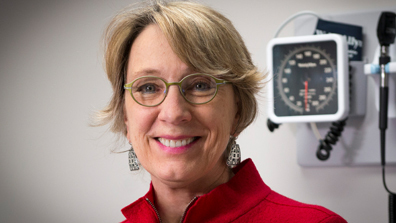 Dr. Butterfield’s experience includes: 1) leadership roles on descriptive, analytic epidemiology, and RCT studies addressing environmental health issues, 2) participation in invited roles at NIH, EPA, and IOM, and 3) serving as the Director of the Occupational and Environmental Health Nursing Program at the University of Washington. Dr. Butterfield served on EPA’s Federal Advisory Committee and is an alumnus of the Robert Wood Johnson Executive Nurse Fellows Program. As Dean of Nursing at Washington State University (2007-2014), Dr. Butterfield guided a transformation of the College’s research culture yielding a commensurate seven-fold increase in grant/contract revenue. She served as principal investigator on an R01 addressing a public health nursing intervention aimed at reducing household environmental health risks to rural low-income children. Dr. Butterfield is the author of “Thinking Upstream,” and related publications addressing the economic, ideologic, and environmental antecedents of public health.